The hot topic at the moment is the cost of renting, as both political parties have seen mileage in wooing these Millennial Generation Renters. The average rent in Aylesbury is currently £881 per month making this a big-ticket item on the monthly budget. I was inquisitive to find out exactly how much Aylesbury Millennials will spend on rent by the time they reach their mid 30’s. 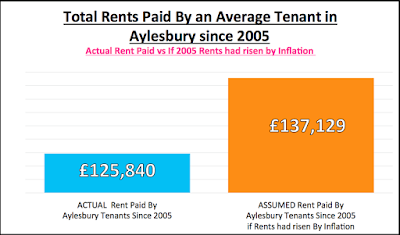 The average age people leave home in the UK is 22; so looking at an Aylesbury 22-year-old (or Millennial) who left home in 2005 then between 2005 and today that Aylesbury Millennial will have shelled out £125,840 in rent. 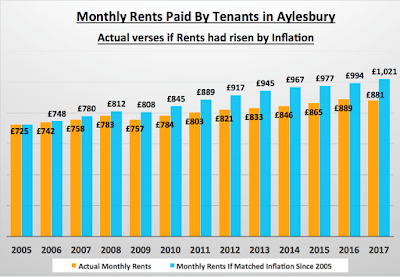 Looking at the chart above, the average rent of an Aylesbury property in 2005 was £725 per month (pm) … if it had risen by inflation, today, that would be £1,021 pm. As I have already mentioned in the article, today it only stands at £881 per month. 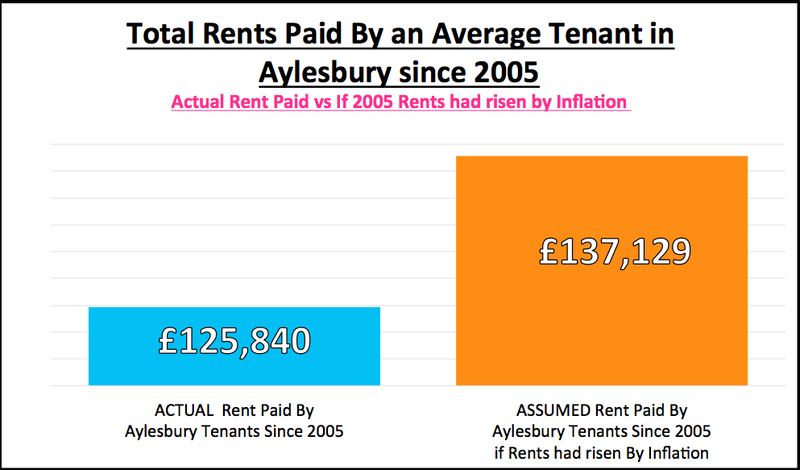 Looking over the last 12 years, adding up all the differences between what the average actual rent was compared to what it should have been if rent had gone up by inflation, the average Aylesbury Millennial tenant would have paid £137,129. 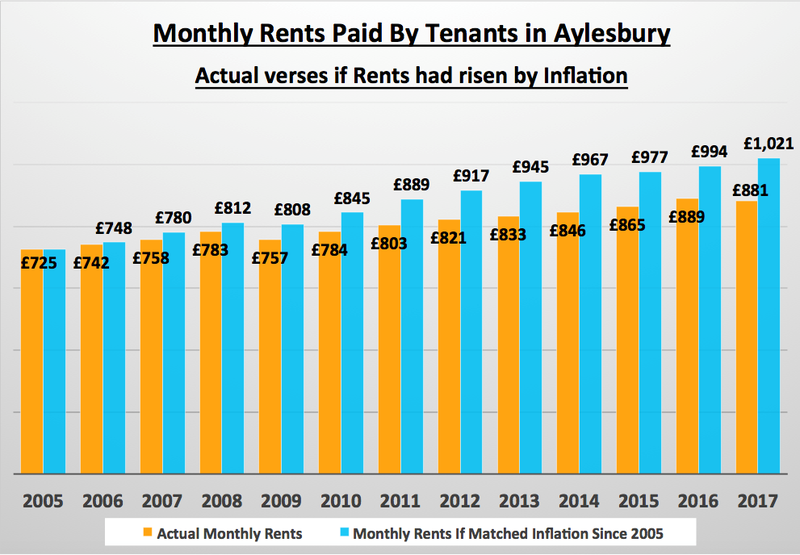 This means that an average 35-year-old Aylesbury Millennial tenant, who has been renting since 2005, is better off by £11,290 when comparing the actual rent paid compared to what it would have been if it had risen by inflation. In a nutshell, tenants have done well due to the sub-inflation growth in rents. In fact, if you recall I mentioned in an article a few weeks ago, the older Aylesbury Millennials are starting to use those savings and are gradually shifting towards home ownership. They are finally catching up with the British homeownership dream as Bank of Mum and Dad help with the deposit. Also, the scrapping of Stamp Duty from the Government starts to kick in together with the realisation that if the 5% mortgage deposit can be scrapped together (yes, 95% first time buyer mortgages have been available since 2009), it is still a lot cheaper to buy than rent, meaning this will unquestionably drive demand for Aylesbury homes for sale – good news for Aylesbury homeowners. … and what does this mean for Aylesbury landlords? Potential for a buy to let investment? This property seems to have been on the market for a very, very long time but it could be worth a look. A two bedroom house just off Ellen Road with good links to town, the hospital and Oxford. the property could be the ideal type of property to rent out. Its marketed by Chancellors with no upper chain and has a guide price of £225,000 but given the length of time this seems to have been marketed for, you might just get a bit of a deal if you are persistent enough. Rental wise, I would expect this to achieve anywhere between £750pcm 4% gross yield (conservatively) and £800pcm (optimistically). There must be a reason its sticking around for so long, but the images paint a good enough picture, perhaps its worth a look at in person? If you do end up looking at this one, I would love to hear your thoughts on it. Aylesbury Property Market – Which Houses are Actually Selling? … And that made me think … is there just one Aylesbury Property Market or many? I like to keep an eye on the property market in Aylesbury on a daily basis because it enables me to give the best advice and opinion on what (or not) to buy in Aylesbury, be that a buy-to-let property for an Aylesbury landlord or an owner occupier house for a home owner. 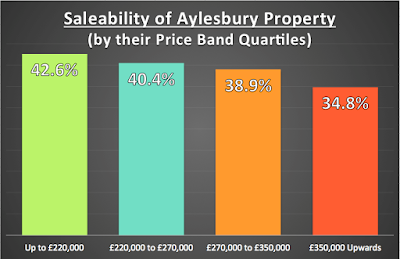 So, I thought, how could I scientifically split the Aylesbury housing market into segments, so I could see which part of the market was performing the best and the worst. 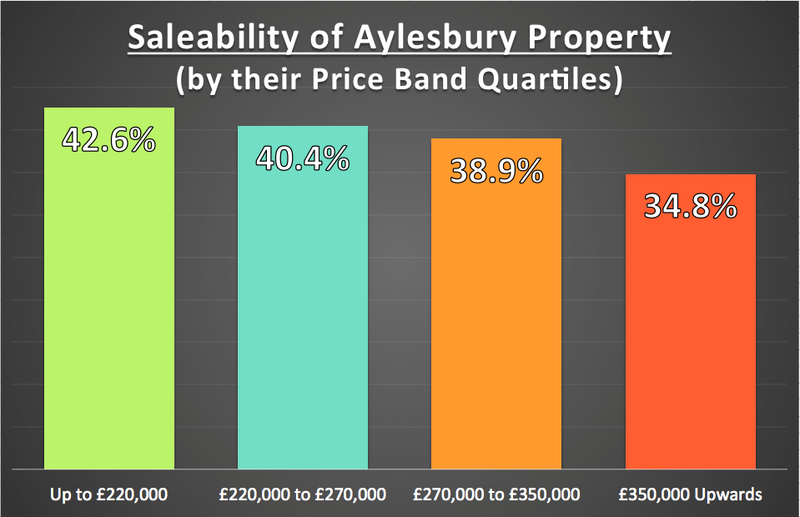 The best performing price range in Aylesbury is the lower market. As I would expect, the upper quartile (the top 25%) is finding things slightly tougher. Interestingly for Aylesbury landlords, the middle market isn’t selling as well as the lower sector, so maybe there could be some bargains out there for buy to let investment? Even though the number of first time buyers did increase in 2017, it was from a low base and the vast majority of 20 something’s cannot buy, so need a roof over their head (hence the need to rent somewhere). It is a fact that British (and Aylesbury’s) housing markets have ridden the storms of Oil crisis in the 1970’s, the 1980’s depression, Black Monday in the 1990’s, and latterly the Credit Crunch together with the various house price crashes of 1973, 1987 and 2008. No matter what happens to us Brexit or anything else ... unless the Government starts to build hundreds of thousands extra houses each year, demand will always outstrip supply … so maybe a time for Aylesbury landlord investors to bag a bargain? Want to know where those Aylesbury buy to let bargains are? 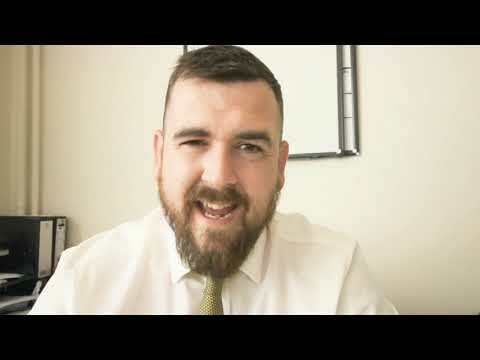 Follow my Aylesbury Property Blog or drop me an email because irrespective of which agent you use, myself or any of the other excellent agents in Aylesbury, many local landlords ask me my thoughts, opinion and advice on what (and what not) to buy locally … and I wouldn’t want you to miss out ... would you? As I have mentioned a number times in my local property blog, with not enough new-build properties being built in Aylesbury and the surrounding area to keep up with demand for homes to live in (be that tenants or homebuyers), it’s good to know more Aylesbury home sellers are putting their properties on to the market than a year ago. At the start of 2007 there were 558 properties for sale in Aylesbury but by February 2008, when the credit crunch was really beginning to bite, that number had risen to 1,567 properties on the market at a time when demand was at an all-time low, thus creating an imbalance in the local property market. Basic economics dictates that if there is too much supply of something and demand is poor (which it was in the Credit Crunch years of 2008/9) … prices will drop. In fact, house prices dropped between 15% and 20% depending on the type of Aylesbury property between the end of 2007 and Spring 2009. However, over the last five years, we have seen a steady decrease in supply of properties coming onto the market for sale and steady demand, meaning Aylesbury property prices have remained robust. A stable housing market is one of the foundations of a successful British economy, as it’s all about getting the healthy balance of buyer demand with a good supply of properties. Nevertheless, if you had asked me a couple of years ago, I would have said we were beginning to see there was in fact NOT enough properties coming on to the market for sale … meaning in certain sectors of the Aylesbury property market, house prices were overheating because of this lack of supply. There were 509 properties for sale 12 months ago, and today that stands at 766. Definitely a step in the right direction to a more stable property market. Even better news, since the Chancellor announced the stamp duty rule changes for first time buyers (FTB), my fellow agents in Aylesbury say that the number of FTB’s registering on the majority of agent’s books has increased year on year. That has still to follow through into more FTB’s buying their first home, however, with the heightened levels of confidence being demonstrated by both Aylesbury house sellers and potential house buyers, I do foresee the Aylesbury Property Market will show steady yet sustained improvement during the first half of 2018. What does this mean for Aylesbury landlords or those considering dipping their toe into the buy to let market for the first time? Landlords will need to keep improving their properties to ensure they get the best tenants. It is true that demand amongst FTB’s is increasing, albeit from a low base. Even with the new landlord tax rules, buy to let in Aylesbury still looks a good investment, providing Aylesbury landlords with a good income at a time of low interest rates and a roller coaster stock market. If you are thinking of investing in bricks and mortar in Aylesbury, it is important to do things correctly as making money won’t be as easy as it has been over the last twenty years. With a greater number of properties on the market .. comes greater choice. Don’t buy the first thing you see, buy with your head as well as your heart … and don’t forget the first rule of Buy To Let Investment ….. The value of all the homes in Aylesbury has risen by more than 252% in the past two decades, to £8.774bn, meaning its worth more than the stock listed company Persimmon, which is worth £8.036bn. Those Aylesbury homeowners and Buy-to-Let landlords who bought their homes twenty or more years ago have come out on top, adding thousands and thousands of pounds to the value of their own Aylesbury homes as the younger generation in Aylesbury continue to be priced out of the market. This is even more remarkable because, in those twenty years, we had the years of 2008 and 2009 following the global financial crisis, where we saw a short term drop in Aylesbury house prices of between 15% and 20% (depending on the type of property). And although there have been a number of consecutive years of growth in property values recently in Aylesbury it hasn’t been anywhere near the levels seen in the early 2000’s. Twenty years ago, the total value of Aylesbury property was worth £2.486bn. Over those twenty years, total property values have increased by £6.288bn, meaning today, the total value of all the properties in Aylesbury is worth £8.774bn. Even more remarkable, when you consider the FTSE100 has only risen by 40.84% in the same time frame. Also, when I compared it with inflation, i.e. the UK Retail Price Index, inflation had risen by 72.2% during the same twenty years. So, what does this all mean for Aylesbury? Well as we enter the unchartered waters of 2018 and beyond, even though property values are already declining in certain parts of the previously over cooked central London property market, the outlook in Aylesbury remains relatively good as over the last five years, the local property market has been a lot more sensible than central London’s. Aylesbury house values will remain resilient for several reasons. Firstly, demand for rental property remains strong with persistent immigration and population growth. Secondly, with 0.25% interest rates, borrowing has never been so cheap and finally, the simple lack of new house building in Aylesbury. Not even keeping up with current demand, let alone eating into years and years of under investment mean only one thing – yes it might be a bumpy ride over the next 12 to 24 months but, in the medium term, property ownership and property investment in Aylesbury has and always will, out ride out the storm.